Today’s blog posting is a little bit off-topic, but still quite interested when you work in the IT area. Maybe a few of you already know it, but over the last few years I have worked (and I’m still working) on a quite interesting side project: I’m developing my own CPU based on primitive AND, OR, XOR, and NOT gates. I was already fascinated by computer science and how you can build just by using 0 and 1 a whole computer system. But in the past I was never, ever able to understand how everything below the operating system is really working. I just knew that a CPU is capable to execute assembly instruction, but how that execution is done on the physical level was already a mystery for me. 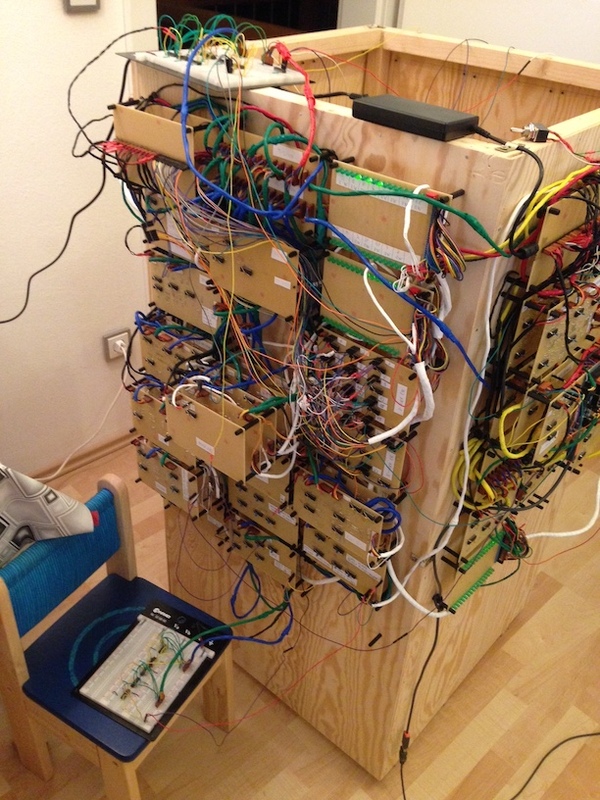 It’s just a mess of wires – with a concept behind it – trust me! Building that whole thing took me now around 3 years (including a *very long* planning and design phase), so it’s a very time consuming, hard, challenging work with *a lot* of soldering involved. And a lot of troubleshooting and bug fixing. At least the root cause of *every* problem you encounter is YOU, YOU, YOU, because there is nothing else there – no bottom layers which could introduce some bugs. And in addition – and that’s now the important point for you – I have also simulated the whole CPU in software. I have built a whole VHDL description of the CPU (which can be simulated within a VHDL simulator), and in addition I have also written an Emulator software in C#, which is able to execute my own assembly programs – written in my own designed and developed assembly language. How cool is that? And now the nice thing: I have released over the last weekend the whole project stuff (VHDL description files, the custom written Assembler, and even the whole Emulator, and even the Debugger!) under the MIT License on Github. You can also follow my project journey on my project website at http://www.cpu-design.at, where I also sometimes blog about the CPU project itself, and other computer science related topics. So if you want to get your hands dirty on real CPU development work, download the code from the Github repository, and play around with it. And trust me: you will learn *a lot* about computer science, and this knowledge can even help you some time in combination with SQL Server – even our famous database that we use in your day-to-day life is just based on 0 and 1! If you are a conference organizer in the IT industry, and you are interested in a talk about such cool topics like CPU development, or how to design your own Assembly Language, please feel free to contact me. Enjoy, and thanks for your time!